Reilly Doukas sent in this one. "This picture is of (from left to right) me, my brother, Pat, Janna Smith and Josh Pruitt. 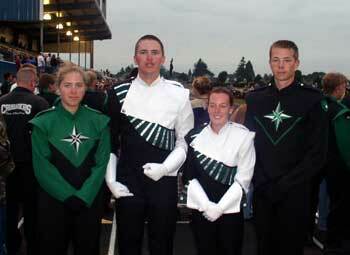 This was my first year in drum corps (and Josh's too). It's been a few years for the other two. Pat, Janna and Josh all graduated from Skyview High school in Vancouver, Wash. It was great to be able to see them and spend time with them during the summer. I look forward to doing it again next year."